Pair the crunchy texture of granola's nuts and grains with creamy low-fat yogurt. People often enjoy this combination as a quick and healthy breakfast option or even as a layered, parfait-like dessert. 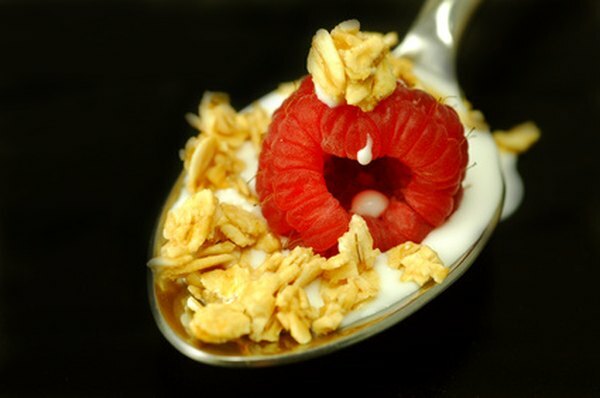 Both yogurt and granola may also offer you several potential health benefits. You need calcium to help maintain the strength of your teeth and bones. Yogurt provides high levels of this essential mineral at a rate of almost 50 percent of your recommended daily value per 8-ounce serving, according to the U.S. Office of Dietary Supplements. Many prepared granola cereals are also fortified with calcium; however it is important to check for added sugar and fat in boxed cereals. Protein helps with the building and repairing of muscles and other tissues in your body. Yogurt gives you a large dose of protein, though the specific amount varies depending on the type. Similarly, many nuts and whole grains — all chief components of most granolas — are high in protein. Many yogurt products are known as probiotic because they contain active cultures of live bacteria, reports the University of Maryland Medical Center. Such yogurt has numerous benefits for your health, including potentially enhancing the strength of your body's immune system. If you suffer from insomnia or have difficulty falling asleep, MayoClinic.com advises eating a small snack a couple of hours before going to bed. This may help you fall asleep faster by keeping hunger pangs at bay. For such purposes, the clinic specifically recommends eating yogurt sprinkled with granola. Fiber helps you digest your food better and may also lower your risk of health problems such as heart disease, reports the Harvard School of Public Health. The school suggests eating 20 to 30 grams of fiber daily. Granola inherently contains lots of fiber due to ingredients such as whole grains and nuts. Fiber content varies depending on the whole-grain concentration. The U.S. Department of Agriculture states that a cup of typical granola supplies approximately 11 grams of fiber. Some types yogurt also provides fiber, especially if it contains added fruit.